My friend Courtney made this for me when I had a broken jaw and my mouth was wired shut. It's a pureed soup, so I was thrilled to be able to eat it. It is absolutely DELICIOUS. 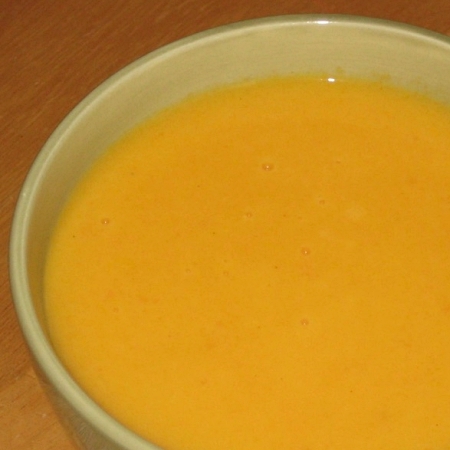 I'm not even a huge fan of carrots, but this soup is one of my favorites! The original recipe used a roux to thicken (butter + flour), but I don't find it necessary. Also, I used half & half instead of heavy cream and used less of it. It is rich and thick, and yummy, and it is the very definition of "comfort food" for me! Combine everything except for the half & half in a soup pot and bring to a boil. Reduce the heat to a simmer (med-low) and cook until the carrots are soft (depends on how small the pieces are, but about 30 minutes). Use a stick blender to puree (if you don't have a stick blender, you can use a blender and just do it in batches). Stir in the cream or half & half and heat through--just don't boil it after adding the half & half.